Em Totenart têm toda a gama de papéis Canson Infinity Photogloss Premium RC para a impressão digital. Infinity Photogloss Premium RC, 270 gr., A4, caixa 25 uds. Infinity Photogloss Premium RC, 270 gr., A3, caixa 25 uds. 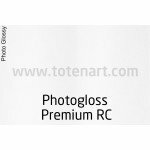 Infinity Photogloss Premium RC, 270 gr., Rolo 0,432x30 mts. Infinity Photogloss Premium RC, 270 gr., A3+, caixa 25 uds. Infinity Photogloss Premium RC, 270 gr., A2, caixa 25 uds. Infinity Photogloss Premium RC, 270 gr., Rolo 0,61x30 mts. Infinity Photogloss Premium RC, 270 gr., Rolo 0,914x30 mts. Infinity Photogloss Premium RC, 270 gr., Rolo 1,118x30 mts. Infinity Photogloss Premium RC, 270 gr., Rolo 1,524x30 mts.